Wine glasses were a relatively late arrival to these shores. The preferred medium for imbibing being made from wood or leather – so much so that a contemporary French source in 1635 is quoted as saying that 'The natives (us) were wont to drink out of their boots'. With some strong incentives from Edward VI, a few Venetian glass makers were lured to Britain to help rectify this. with a facon de Venise stem. Whilst many modern glasses are seen as cheap and disposable, wine glasses were once highly prized and reputedly more desirous than either gold or silver goblets. 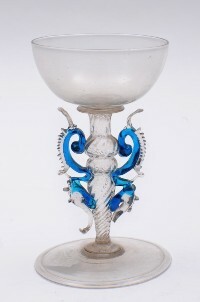 A balluster wine glass, circa 1740. 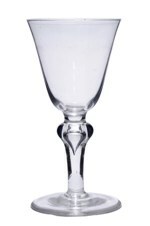 An airtwist wine glass of circa 1740-60. English wine glasses were generally made in three parts: the foot, stem and bowl, although sometimes a stem could be spun out into a bowl in a two-piece glass. However, it is the stem that can offer the greatest clues as to the age and, broadly speaking, the main stem forms are as follows. Mid-to-late 17th century - 'Facon de Venise' in the Venetian manner with dainty, fragile and often intricately modelled spikes, ears and collars and quite often coloured. The 1740/50s – solid moulded pedestal stems often square (but sometimes with more facets) and sometimes referred to as Silesian in form and the first plain straight stems appear. Any of the preceding type may have decoration in the form of bubble inclusions. 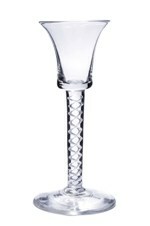 The 1750/60s – the Air Twist stem containing a decorative pattern of clear spirals within the stem formed by indenting a hot squat cylinder of glass with pins before spinning and pulling out to create requisite elongate and decorative form of stem. These lighter form of stems were made in response to an excise tax on glass. The 1760/80s – the Opaque Twist stem containing a decorative spiral of white (more rarely coloured) within the stem formed by the introduction of small rods of coloured glass into the hot squat cylinder before spinning and pulling to shape. The 1780/90s – the Faceted stem with the advent of the 1777 Excise Tax that further doubled the duty payable on glass, the only method to further reduce glass usage without compromise to strength was to cut the stem with a honeycomb series of diamonds. The excessive glass tax was probably one reason why Irish glass became popular. 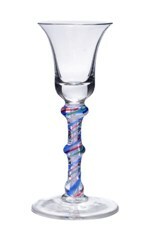 A mixed colour opaque twist wine glass, circa 1770.